In Philo and the Mishnah. Third of the great festivals on which all males were required to make pilgrimages to the Temple at Jerusalem. The celebration of this festival begins on the fifteenth day of the seventh month (Tishri). Originally it lasted seven days; but in the course of time its duration was extended to nine days. In the Bible it is variously styled , "the Feast of Tabernacles" (Lev. xxiii. 34; Deut. xvi. 13, 16; xxxi. 10; Zech. xiv. 16, 18, 19; Ezra iii. 4.; II Chron. viii. 13); , "the Feast of Ingathering" (Ex. xxiii. 16, xxxiv. 22), or merely , "the Feast" (I Kings viii. 2; Ezek. xlv. 23; II Chron. vii. 8); or , "Feast of the Lord" (Lev. xxiii. 39; Judges xxi. 19). In the Septuagint the first designation is rendered by ἡ ἑορτὴ (τῶν) σκηνῶν or τῆς σκηνοπηλίας; the second by ἡ ἑορτὴ συντελείας or συναγωγῆς. II Macc. x. 6 has ἡ τῶν σκηνῶν ἑορτή; Josephus ("Ant." iv. 209; comp. ib. iii. 247) and the New Testament (John vii. 2) σκηνοπηλία; Philo ("De Septenario," § 24) σκηναί; and Plutarch ("Symposiaca," iv. 6, 2) σκηνή. In later Hebrew literature (Aramaic, ) is generally employed. From the frequent notice of it, as well as from its designation as "the Feast," it would seem that the Feast of Tabernacles held the most prominent place among Israel's festivals. That it was agricultural in origin is evident from the name the "Feast of Ingathering," from the ceremonies accompanying it, and from the season and occasion of its celebration: "At the end of the year when thou gatherest in thy labors out of the field" (Ex. xxiii. 16, xxxiv. 22, R. V.); "after that thou hast gathered in from thy thrashing-floor and from thy wine-press" (Deut. xvi. 13, 16, R. V.). It was more particularly a thanksgiving for the fruit harvest (comp. Judges ix. 27); but coming as it did at the completion of the entire harvest, it was regarded likewise as a general thanksgiving for the bounty of nature in the year that had passed. Connected with the possession of the land, it may have had a Canaanitish prototype (see Judges l.c.). Early, however, it appears as an Israelitish festival, celebrated yearly at Shiloh with dances by the maidens in the vineyards (ib. xxi. 19) and with family pilgrimages and sacrifices (I Sam. i. 3, 7, 21). Such even then was its prominence that it alone was celebrated at a central sanctuary, whereas the other festivals, it would seem from the absence of express statement regarding the question, were celebrated, if at all, at local shrines. In early times the festival had no fixed date. Under the early kings it was apparently celebrated in the eighth month. In this month the Temple was completed (I Kings vi. 38); and it is most probable that the dedication followed immediately (ib. viii. 2, 65, would therefore be erroneous, as its dating involves a delay of eleven months). This date is further confirmed by the report (ib. xii. 32) that Jeroboam "ordained a feast, in the eighth month, on the fifteenth day of the month, like unto the feast that is in Judah." But in the earlier laws no definite time is appointed. As in I Sam. i. 20, so in Ex. xxxiv. 22, the phrase is at the "revolution of the year," or "when thou hast gathered in thy labors out of the field" (Ex. xxiii. 16). It is simply the "Feast of Ingathering," one of the three pilgrimage festivals, when all males are obligated to appear at the sanctuary (xxiii. 17, xxxiv. 23); no further directions as to the manner of celebration are given. No more definite is the date in Deuteronomy, where the festival is called "the Feast of Tabernacles" (xvi. 13-16), and, as in Exodus, its celebration is observed "after that thou hast gathered in from thy thrashing-floor and thy wine-press" (xvi. 13). Further particulars, however, are here added. The celebration is to take place only at the divinely chosen sanctuary. It is to be a joyous season, and, in the humanitarian spirit of Deuteronomy, the unfortunate and the dependent are to share in the festivity. The holiday is to last seven days (as already presupposed in I Kings viii. 66). The dwelling in booths is here taken for granted—presumably as an existing practise going back to the custom of living in booths during the fruit harvest, a custom which has survived to this day in Palestine. Further, it is ordained that every seventh year—the "year of release"—the Law is to be read to the assembled multitude (xxxi. 10, 11). It is also assumed that the Feast of Booths was the season for bringing to Jerusalem the first-fruits—a command for which Deut. xxvi. 1-11 assigns no time—as also for bringing the Deuteronomic tithes (see Cheyne, "Encyc. Bibl." s.v. 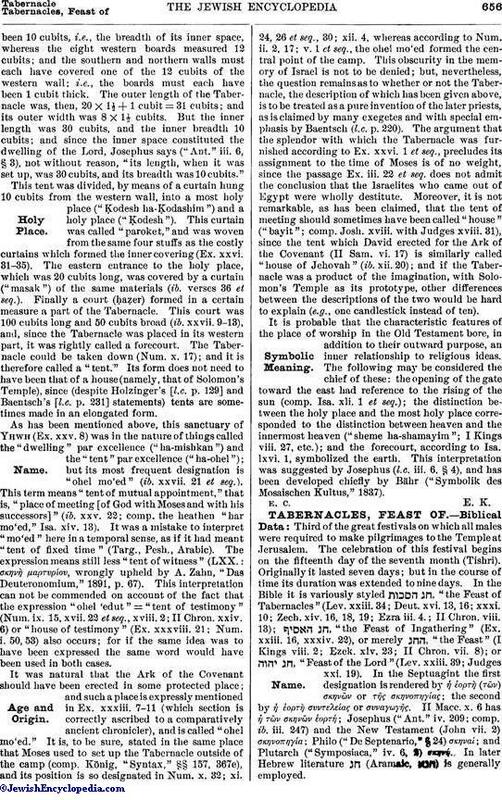 "Tabernacles," § 4; Herzog-Hauck, "Real-Encyc." xl. 304). The older law contained in Lev. xxiii. 39-43 amplifies the Deuteronomic legislation. 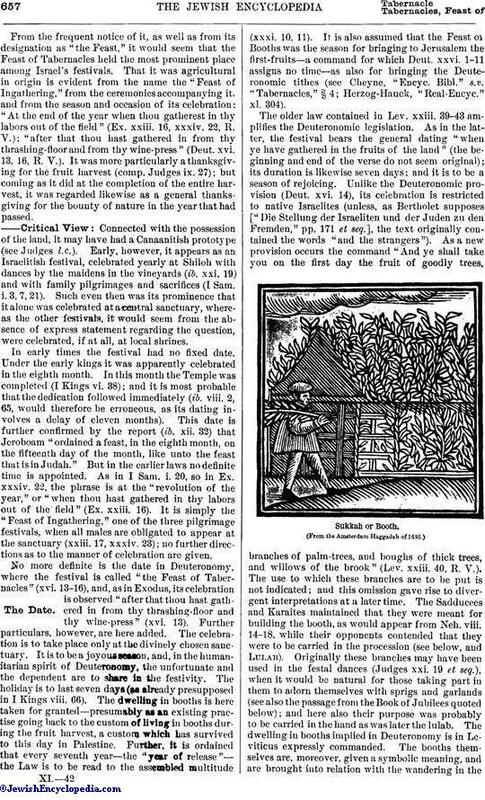 As in the latter, the festival bears the general dating "when ye have gathered in the fruits of the land" (the beginning and end of the verse do not seem original); its duration is likewise seven days; and it is to be a season of rejoicing. Unlike the Deuteronomic provision (Deut. xvi. 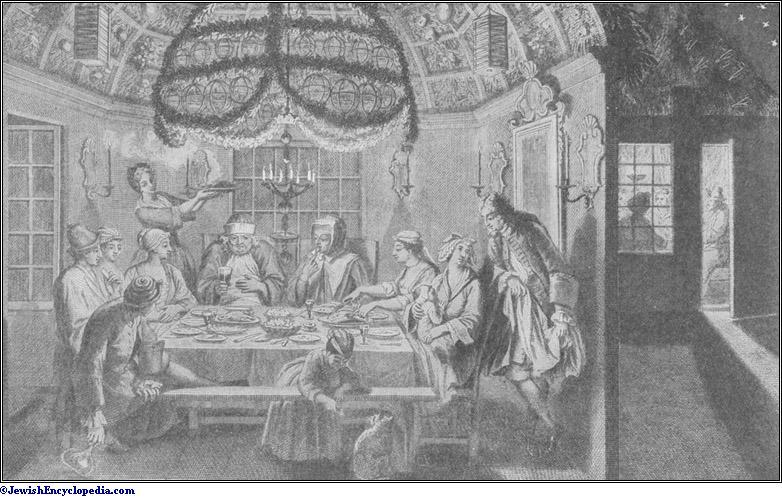 14), its celebration is restricted to native Israelites (unless, as Bertholet supposes ["Die Stellung der Israeliten und der Juden zu den Fremden," pp. 171 et seq. ], the text originally contained the words "and the strangers"). As a new provision occurs the command "And ye shall take you on the first day the fruit of goodly trees, branches of palm-trees, and boughs of thick trees, and willows of the brook" (Lev. xxiii. 40, R. V.). The use to which these branches are to be put is not indicated; and this omission gave rise to divergent interpretations at a later time. The Sadducees and Karaites maintained that they were meant for building the booth, as would appear from Neh. viii. 14-18, while their opponents contended that they were to be carried in the procession (see below, and Lulab). Originally these branches may have been used in the festal dances (Judges xxi. 19 et seq. ), when it would be natural for those taking part in them to adorn themselves with sprigs and garlands (see also the passage from the Book of Jubilees quoted below); and here also their purpose was probably to be carried in the hand as was later the lulab. The dwelling in booths implied in Deuteronomy is in Leviticus expressly commanded. The booths themselves are, moreover, given a symbolic meaning, and are brought into relation with the wandering in thewilderness—"that your generations may know that I made the children of Israel to dwell in booths, when I brought them out of the land of Egypt." Significant in this new interpretation attached to the feast is the conversion of the harvest festival into a historical festival. When the Deuteronomic reformation had made the Feast of Tabernacles a general Temple festival, a more exact date became necessary; and this need is supplied by Ezekiel xlv. 25. He designates the holy day as the "feast" or the "feast of the Lord," and fixes the fifteenth of the month as the time for beginning its celebration. This date had already become customary, it appears (I Kings viii. 2). More definiteness is also introduced in the method of observance. The sacrifices that were formerly voluntary are now prescribed—every day a burnt offering of seven bullocks and seven rams and a sin-offering of a he-goat; and with each bullock and each ram a meal-offering of an epha, and a hin of oil (Ezek. xlv. 23-24). The last stage of legal evolution appears in Lev. xxiii. and Num. xxix. 12-38. The date and duration of the festival are the same as in Ezekiel; the name, as in Deuteronomy. As in Ezekiel, the agricultural significance is altogether absent. Furthermore, an eighth day is added as a concluding festival ("'aẓeret"; Lev. xxiii. 36, 39; Num. xxix. 35), which has an independent character: like the first day, it is a "holy convocation"; on it no labor is permitted, in which respect, as also in the sacrifices, it differs from the intervening six days. Exact sacrificial prescriptions are given in Num. xxix. 13-39, distinguishing this festival from the rest in the abundance of sacrifices. In addition to the daily regular offerings, there is to be a daily burnt offering of two rams, fourteen lambs, and bullocks—thirteen on the first day, twelve on the second day, and so diminishing by one daily on the other five days. In each case there is to be also the proper meal-offering of fine flour mixed with oil—three-tenths to each bullock, two-tenths to each ram, and one-tenth to each lamb. As a sin-offering a he-goat is to be sacrificed daily. On the eighth day the sacrifices differ, consisting of a he-goat as a sin-offering, and a single bullock, a ram, and seven lambs as a burnt offering—all of which are brought together with the meal-offering appropriate in each case. 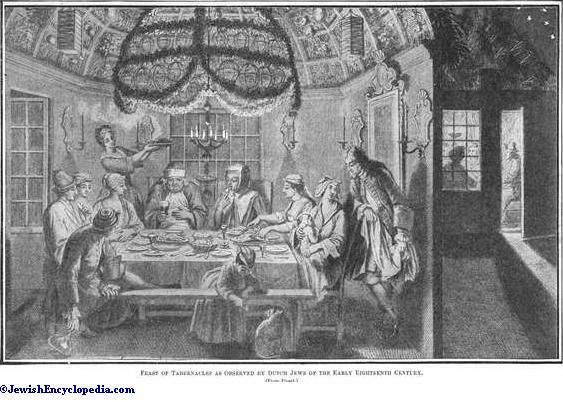 Feast of Tabernacles Among German Jews of the Eighteenth Century. (From Bodenschatz, "Kirchliche Verfassung," 1748. )Post-Exilic Celebration. 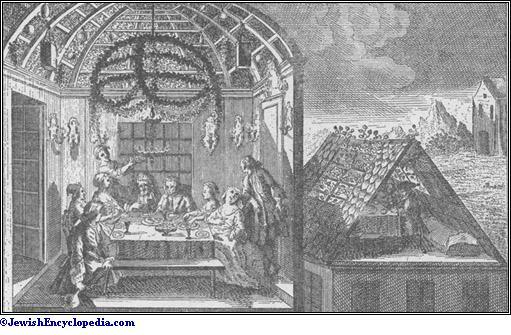 Feast of Tabernacles as Observed by Dutch Jews of the Early Eighteenth Century. After the return from the Captivity occurs the first mention of a celebration of the festival in strict conformity with the Law. Mention of its observance is made in Ezra iii. 4; and a description is presented in Neh. viii. 14-18. Here it is said that the feast was observed in obedience to the command to dwell in booths. The people gathered "olive-branches, and branches of wild olive, and myrtle-branches, and palm-branches, and branches of thick trees, to make booths, as it is written," and they "made themselves booths, every one upon the roof of his house, and in their courts, and in the courts of the house of God, and in the broad place of the water gate, and in the broad place of the gate of Ephraim" (ib. viii. 15-16, R. V.). While no mention is here made of the sacrifices (as in Ezra iii. 4), the dwelling in booths is given special prominence, the writer adding that "since the days of Jeshua the son of Nun unto that day had not the children of Israel done so" (Neh. viii. 17). The inference is that with the transfer of the festival to the Temple, the ancient practise had lost all significance, until revived with the historical meaning, and referred to the tents in which Israel had dwelt in the wilderness (on this point see Cheyne, "Encyc. Bibl." s.v. "Tabernacles"). According to Nehemiah's account of the celebration, the Law was read every day; the eighth day was duly celebrated as a solemn assembly (viii. 18). II Chron. vii. 8, transferring the festival of its time to antiquity, represents Solomon as celebrating an eight-day festival and as dismissing the people on the twenty-third day of the month (i.e., the ninth day), whereas in reality Solomon dismissed the people on the eighth day (I Kings viii. 66). The place held by the festival in post-exilic times shows itself clearly in Zech. xiv. 16-19. According to the author, Tabernacles is in the Messianic era to become a universal festival; and all the surrounding nations will make pilgrimages annually to Jerusalem to celebrate the feast there. Furthermore, the festival is here associated with the granting of rain—an idea further developed in later literature (see below)—the penalty to be visited on the nations who fail to come to Jerusalem being the withholding of rain. The festival continued to develop; and there were later added a number of features that are not described in the Biblical passages. In the liturgy it became known as the "season of our joy" ("zeman simḥatenu"). The Law in Lev. xxiii. 40 was generally interpreted to refer to the festal thyrsus, and minute regulations centered about it. The duty of dwelling in booths gave rise to much legislation as to what constituted a booth and what signified residence therein. Symbolic meanings were attached to the booth, the festal bouquet, and the other ceremonies. Practises, some perhaps of ancient origin, grew up, prominently the libation of water and the rejoicing connected therewith on the second evening of the festival. The seventh day of the feast assumed a special and solemn character (see Hosha'na Rabbah), and when the holy days were celebrated for two days the ninth day thus added took on distinctive features (see Simḥat Torah). In the Book of Jubilees the origin of the feast is carried back to Abraham (see ed. R. H. Charles. xvi. 20-31 and notes ad loc.). Abraham celebrates it with sacrifices (deviating in character, however, from the Biblical precepts) and by dwelling in booths, "for it is ordained forever regarding Israel that they should celebrate it and dwell in booths and set wreaths upon their heads and take leafy boughs and willows from the brook. And Abraham took branches of palm-trees and the fruit of good trees, and every day going around the altar with the branches seven times in the morning, he praised and gave thanks to his God for all things in joy." Jacob likewise celebrates the feast (ib. xxxii. 4-9). The description is strikingly at variance in a number of points with the later manner of celebration. The eighth day is not mentioned at all. Abraham is described as setting wreaths on his head—a detail that is unique. The marching around the altar seven times was later customary only on the seventh day. II Macc. x. 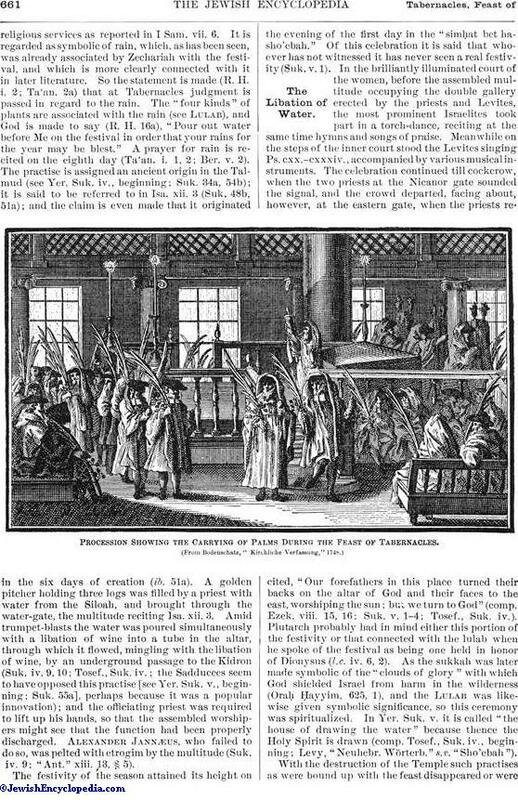 6-7 speaks of an eight-day celebration, similar to the Feast of Tabernacles, at the rededication of the Temple, in which the people carried wands encircled with foliage, palm-branches, and other beautiful branches (see also Ps. cxviii. 25). Josephus speaks of Tabernacles as a "most holy and important feast" ("Ant." viii. 4, § 1), describing it as an eight-day festival celebrated by dwelling in booths and by offering sacrifices in the Temple. On it the people "carry in their hands branches of myrtle and willow and a bough of the palm-tree with the addition of the pomecitron" (ib. iii. 10, § 4); the same fruit is elsewhere called "citron" (ib. xiii. 3, § 5). The feast is alluded to in John vii. 1-x. 21 also. 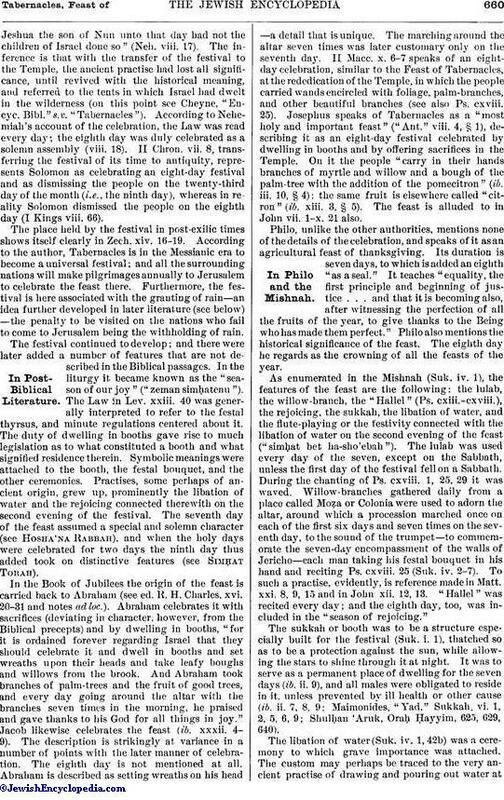 Philo, unlike the other authorities, mentions none of the details of the celebration, and speaks of it as an agricultural feast of thanksgiving. Its duration is seven days, to which is added an eighth "as a seal." It teaches "equality, the first principle and beginning of justice . . . and that it is becoming also, after witnessing the perfection of all the fruits of the year, to give thanks to the Being who has made them perfect." Philo also mentions the historical significance of the feast. The eighth day he regards as the crowning of all the feasts of the year. As enumerated in the Mishnah (Suk. iv. 1), the features of the feast are the following: the lulab, the willow-branch, the "Hallel" (Ps. cxiii.-cxviii. ), the rejoicing, the sukkah, the libation of water, and the flute-playing or the festivity connected with the libation of water on the second evening of the feast ("simḥat bet ha-sho'ebah"). The lulab was used every day of the seven, except on the Sabbath, unless the first day of the festival fell on a Sabbath. During the chanting of Ps. cxviii. 1, 25, 29 it was waved. Willow-branches gathered daily from a place called Moẓa or Colonia were used to adorn the altar, around which a procession marched once on each of the first six days and seven times on the seventh day, to the sound of the trumpet—to commemorate the seven-day encompassment of the walls of Jericho—each man taking his festal bouquet in his hand and reciting Ps. cxviii. 25 (Suk. iv. 2-7). To such a practise, evidently, is reference made in Matt. xxi. 8, 9, 15 and in John xii. 12, 13. "Hallel" was recited every day; and the eighth day, too, was included in the "season of rejoicing." 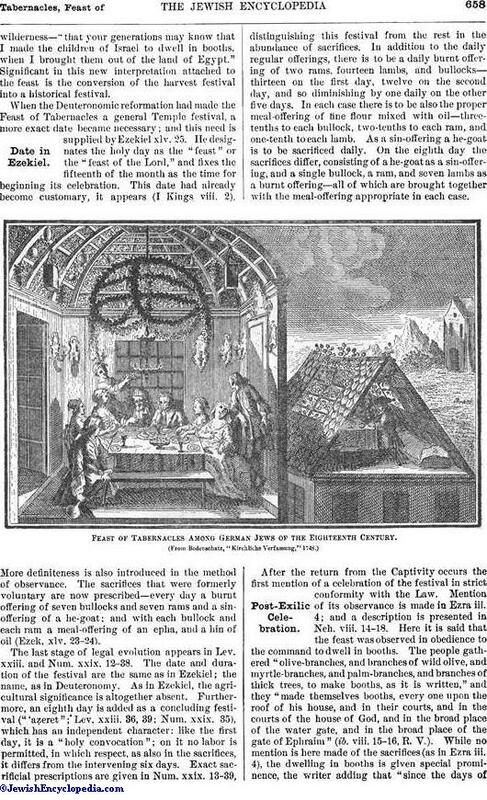 The sukkah or booth was to be a structure especially built for the festival (Suk. i. 1), thatched so as to be a protection against the sun, while allowing the stars to shine through it at night. It was to serve as a permanent place of dwelling for the seven days (ib. ii. 9), and all males were obligated to reside in it, unless prevented by ill health or other cause (ib. ii. 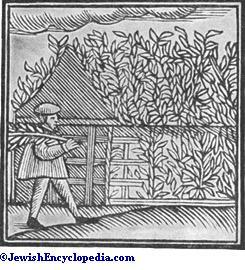 7, 8, 9; Maimonides, "Yad," Sukkah. vi. 1, 2, 5, 6, 9; Shulḥan 'Aruk, Oraḥ Ḥayyim, 625, 629, 640). The libation of water (Suk. iv. 1, 42b) was a ceremony to which grave importance was attached. The custom may perhaps be traced to the very ancient practise of drawing and pouring out water atreligious services as reported in I Sam. vii. 6. It is regarded as symbolic of rain, which, as has been seen, was already associated by Zechariah with the festival, and which is more clearly connected with it in later literature. So the statement is made (R. H. i. 2; Ta'an. 2a) that at Tabernacles judgment is passed in regard to the rain. The "four kinds" of plants are associated with the rain (see Lulab), and God is made to say (R. H. 16a), "Pour out water before Me on the festival in order that your rains for the year may be blest." A prayer for rain is recited on the eighth day (Ta'an. i. 1, 2; Ber. v. 2). The practise is assigned an ancient origin in the Talmud (see Yer. Suk. iv., beginning; Suk. 34a, 54b); it is said to be referred to in Isa. xii. 3 (Suk. 48b, 51a); and the claim is even made that it originated in the six days of creation (ib. 51a). A golden pitcher holding three logs was filled by a priest with water from the Siloah, and brought through the water-gate, the multitude reciting Isa. xii. 3. Amid trumpet-blasts the water was poured simultaneously with a libation of wine into a tube in the altar, through which it flowed, mingling with the libation of wine, by an underground passage to the Kidron (Suk. iv. 9, 10; Tosef., Suk. iv. ; the Sadducees seem to have opposed this practise [see Yer. Suk. v., beginning; Suk. 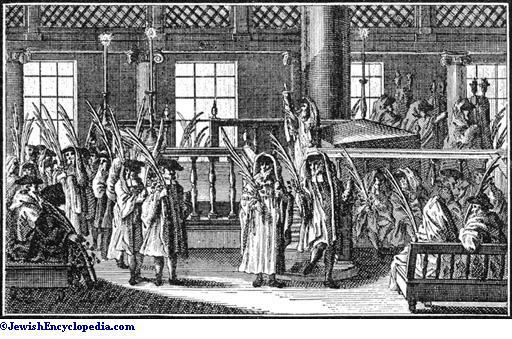 55a], perhaps because it was a popular innovation); and the officiating priest was required to lift up his hands, so that the assembled worshipers might see that the function had been properly discharged. Alexander Jannaæus, who failed to do so, was pelted with etrogim by the multitude (Suk. iv. 9; "Ant." xiii. 13. § 5). The festivity of the season attained its height on the evening of the first day in the "simḥat bet ha-sho'ebah." Of this celebration it is said that whoever has not witnessed it has never seen a real festivity (Suk. v. 1). In the brilliantly illuminated court of the women, before the assembled multitude occupying the double gallery erected by the priests and Levites, the most prominent Israelites took part in a torch-dance, reciting at the same time hymns and songs of praise. Meanwhile on the steps of the inner court stood the Levites singing Ps. cxx.-cxxxiv., accompanied by various musical instruments. The celebration continued till cockcrow, when the two priests at the Nicanor gate sounded the signal, and the crowd departed, facing about, however, at the eastern gate, when the priests recited, "Our forefathers in this place turned their backs on the altar of God and their faces to the east, worshiping the sun; but we turn to God" (comp. Ezek. viii. 15, 16; Suk. v. 1-4; Tosef., Suk. iv.). Plutarch probably had in mind either this portion of the festivity or that connected with the lulab when he spoke of the festival as being one held in honor of Dionysus (l.c. iv. 6, 2). As the sukkah was later made symbolic of the "clouds of glory" with which God shielded Israel from harm in the wilderness (Oraḥ Ḥayyim, 625, 1), and the Lulab was likewise given symbolic significance, so this ceremony was spiritualized. In Yer. Suk. v. it is called "the house of drawing the water" because thence the Holy Spirit is drawn (comp. Tosef., Suk. iv., beginning; Levy, "Neuhebr. Wörterb." s.v. "Sho'ebah"). Procession Showing the Carrying of Palms During the Feast of Tabernacles. With the destruction of the Temple such practises as were bound up with the feast disappeared or weremodified to fit altered conditions. The sukkah and the lulab remained; the latter was, however, not to be used on the Sabbath, even when this was the first day. In the synagogue the season was distinguished by the liturgy. The entire "Hallel" was recited even on the intervening days ("ḥol ha-mo'ed"). Hymns ("piyyuṭim") containing allusions to the festival were introduced in both morning and evening prayers. At the "Hallel" the lulab was waved as it had been in the Temple. Every day selections from the Torah were read. The sections from the Pentateuch and the hafṭarot are such as refer to the festival. Thus on the first and second days Lev. xxii. 26-xxxiii. 44, which concludes with the Biblical law on Sukkot, is read; for the Mafṭir the selection is the sacrificial prescription for the day (Num. xxix. 12-16). The hafṭarah for the first day is the passage already discussed above (Zech. xiv. 1-21), and that for the second day is I Kings viii. 2-21, recounting the dedication of the Temple, an event which occurred on the festival. For the intervening days the Scriptural selection is from Num. xxix. 17-34, except when a Sabbath occurs, when the appropriate section from this passage is read for the mafṭir, and the Scriptural reading is Ex. xxxiii. 12-xxxiv. 26, wherein are contained the laws commanding the observance of Sabbath (xxxiv. 21) and of Tabernacles (xxxiv. 22); the hafṭarah is Ezek. xxxviii. 18-xxxix. 16, which is understood to refer to the time prophesied by Zechariah in ch. xiv. (For the readings from the Torah see Meg. 31a.) The Book of Ecclesiastes is read on such a Sabbath just before the Scriptural section, or, if no Sabbath occurs, it is read on Shemini 'Aẓeret. Ibn Yarḥi assigns as a reason for the practise that King Solomon read this book to the people who had assembled on Tabernacles ("Ha-Manhig," section "Sukkah," 27; see note to Ḳohelet in the Rödelheim edition of Maḥzor for Sukkot). The Musaf is recited every day. On the first two days and on the last two the Dukan is pronounced. On the first seven days, except on a Sabbath, the Musaf is followed by a procession, the worshipers, lulab in hand, marching around the reading-desk and reciting hymns having as their refrain "Hosha'na!" (Deliver Thou!). This custom is a memorial of the libation of water in the Temple (see Vitry Maḥzor, ed. 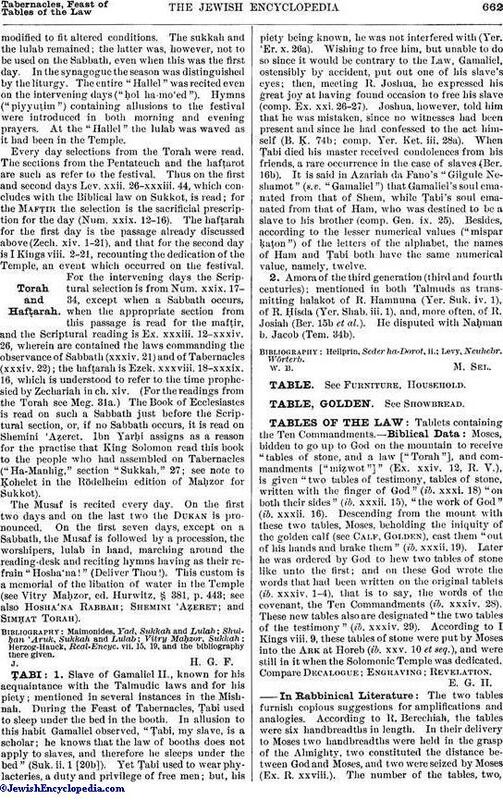 Hurwitz, § 381, p. 443; see also Hosha'na Rabbah; Shemini 'Aẓeret; and Simḥat Torah). Herzog-Hauck, Real-Encyc. vii. 15, 19, and the bibliography there given.